Updates to the Flickr interface seem to be gaining momentum with the latest being justified view for groups. To experience this, click on the "more photos" link on any public group home page. In addition to the improved presentation for the thumbnails, you can click on the magnifying glass icon in the lower right corner of each image to get a lightbox view. When you close the lightbox, you're returned to the justified view interface. To get to a photographer's photostream, click on the thumbnail itself. The image will be opened on the photographer's page. Hit the browser back button to return to the justified view of the group thumbnails. 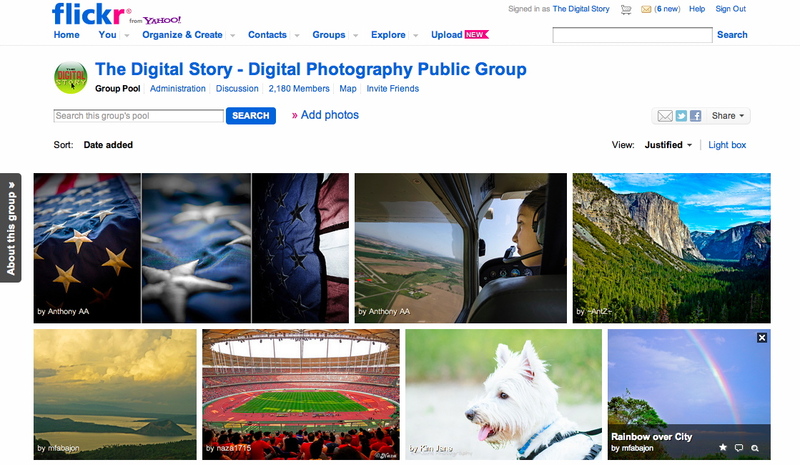 We have a Digital Story Public Group with over 2,000 members and some amazing imagery. The Digital Story Member Photo of the Day is selected from this pool. Plus the TDS Member Gallery on the site pulls from our public group. Wow, Anderson Cooper last night just talked about how many site misspell the word "pubLic" as "pubic" as seen in the link, Digital Story Pubic Group. Even though it is long overdue, these changes Flickr is making are really great. It is so nice to see the full sized images instead of those terrible square thumbnails. I just wish they would bring the justified view to the Sets display.